Hello everyone! In our last two Scion’s Schools, we talked about the basics of playing against the AI and getting your first decks together. Today we’re going to talk about getting started against human players using Eternal’s ranked mode. Eternal’s ranked system is your most consistent method of gaining gold to purchase access to Drafts and Forges – if you’re a free to play player, you’ll spend most of your time here after you’ve advanced your Forge and Gauntlet to whatever tier you feel is optimal. You are matched against other players by both position in ranking and overall experience/winrate, but in the interest of both quick matchmaking and variety of gameplay, you will see a wide band of players both above and below your skill level. PvP games reward a Bronze chest every win (which, remember, has a 10% chance of upgrading to a Silver, a 1% chance of upgrading to a gold, and a .1% chance of upgrading to a Diamond chest). Your third win will give you a Silver chest instead. As every chest gives you a small amount of gold and a card, you can fill out your commons and uncommons very quickly by winning ranked games, and build up gold to purchase Forges, Drafts, or packs. There are five ranked leagues: Bronze, Silver, Gold, Diamond and Master. Unlike Gauntlet, Forge and Draft leagues, Ranked leagues have three separate divisions, each ranked from 0 to 100. Wins increase your points in your division based on the skill rating of the players you face, up to about 20 points, and losses decrease your points by slightly lower amounts. When you reach 100 points, you are promoted to the next division (Bronze III to Bronze II, Bronze I to Silver III). Being reduced to 0 points won’t demote you immediately, but losing multiple games in a row will eventually cause you to fall back a division. It’s also possible (if not easy) to drop a league in this fashion. At the end of each month, your league determines a number of premium cards and packs that you get as a reward, ranging from two premium uncommons and one pack for participating in Bronze League to a premium legendary and three packs for reaching the vaunted Master league. You can check the exact rewards for each league in the Profile tab, under Rewards. A) Build reliable decks that can hit the same high notes on multiple occasions. Like Gauntlet, it’s better for a deck to have multiple redundancies than one single swan song. Look for cards that accomplish similar goals. If you’re an aggro deck, make sure you have at least 12 2-drops that will accomplish similar goals. If you want to build a combo deck, your combo should have several different iterations, and a lot of ways to seek out or protect that combo. Most decks run at least 24 units and can go well upwards of 30. B) Supplement that reliability with good power choices. Four Seek Power should be the rule in most decks, with only very specific exceptions. Stack Banner cards on top of Seats if you have deep influence requirements, or run Diplomatic Seals if you have few influence symbols but multiple colors to hit. Remember that the minimum 25 power is dangerous (even with the new mulligan system) and only suited to the fastest of aggro decks. Run a balanced curve where you can, especially before the five power mark. C) Keep a good balance of tricks, removal and other cards that solve problems. This is more crucial than ever! Of the amount and type of decks that you encounter, there will always be a portion of them that are dedicated silly nonsense with crucial weak points you can exploit (in other words, if you ever run into me on ladder…) Not being able to deal with bomb cards and combo pieces is crucial, and removal cards also tend to weigh favorably against rares and legendaries you may not have yet. D) Remember the AI’s strengths – knowing when to attack and when not to, utilizing multiple blocks to reap good trades. You’ll be refining these skills and others with the games that you play. Playing for optimal value and knowing how to get a deck to give you the right cards reliably is a key part of making sure that you’re ready to face whatever. But the real fun of Eternal is definitely that “whatever” you’re about to face. Human beings are full of cool surprises and out-of-the-box decks, and there’s a lot more to consider when facing off against other people. Now that you’re playing against real people, you’re going to see a lot of new tricks and traps going on. In some ways, even good card players will play a little like the computer – they’ll fall for similar traps, and they’ll bluff very little unless there’s nothing to lose. But in many other ways, you’re going to see people doing things with their cards that the computer would never reach for – crazy combos and hyper-efficient curves, lockdown control decks and weird infiltrate techs. Rules will be bent. Conceptions will be broken. Lots of new and bizarre things will happen. My personal recommendation is – don’t get discouraged if you get knocked down by something you weren’t expecting. Every time you see something awesome, write it down or make a note of it somehow. Try the strategy yourself, if you have the cards for it – nothing exposes the weaknesses of a particular strategy than running it yourself. Over time, you’ll be able to easily predict from the cards your opponent is playing what kind of cards they are running in their deck, and alter your strategy to win against those cards. In the meantime, the most helpful bit of advice for new players is to learn to read the pauses. During attacks, in response to spells that target them, and at the end of your turn, your opponent may create a brief pause in the flow of the game turn where the computer is prompting them to do something and they have to click continue. This is an intended design feature of Eternal, and can betray as much knowledge as reading an opponents face in a physical card game. Whenever you see a pause, note how much power your opponent has and in what colors, because the pause means that they have a fast spell or ambush unit they can cast, but have chosen not to. As time goes on, you’ll learn to guess the tricks, but just knowing that they’re there is pretty useful. The obvious example: If your opponent has only one red influence and one power, they are virtually guaranteed to be holding onto the card Torch (though it could be Temper! Nothing is certain in life.) If they have Shadow influence, it’s Rapid Shot; If it’s Justice, Protect or Finest Hour. Pay attention to where the pauses don’t happen to: If you get a pause when attacking into two Primal power, but not at the end of turn, then your opponent probably decided not to cast a Lightning Strike on your unit. Identifying when certain cards are in your opponents hand can give you a huge amount of insight into what their gameplan is and how to play around it. Well-built decks, good reads and smart plays will get you everywhere, but there are other things you can leverage too. Let’s talk a little about the metagame. You can’t build a deck that will beat every other deck in Eternal 100% of the time (or at least, no one’s ever managed it yet). But you can beat decks that have extremely high winrates – enough to climb the ranks – against the decks that are most common at the time you are playing. This is what we call the metagame of Eternal – determining what type of decks players are running, and then building to counter those decks. Typically, metagames are somewhat cyclical, though each loop is different from than the last. Say an aggressive aggro burn deck is really popular at the moment. The best way to beat a deck is typically to run something with a very slightly slower curve – that way, you have bigger cards than your opponent, but you don’t play them so slowly that you lose before those cards are relevant. So adopting a fast-but-not-too-fast tempo deck can be a great choice, especially if it has cards like Combrei Healer and Stand Together that give the burn decks a hard time. If enough people follow suit, then Combrei Tempo might become the ranking meta choice – making a more midrangey option a solid choice! Of course, Midrange tends to get answered by control, which then gets answered by even slower control, which happens to be SO slow that it’s time for the aggro decks to reign all over again. To keep things fresh, Direwolf also releases regular batches of promo cards that everyone will want to try out in their decks. The meta is always moving – sometimes fast, sometimes slow. If you can correctly identify the deck that is popular and stay a step ahead of these cycles, you’ll be favored to advance in your league. It’s OK to alter the deck in response to what you are seeing, but it’s typically better to play multiple games with new changes to get a feel for what’s different. Changing decks too rapidly can have structural consequences: disrupting your curve or unit balance, or weighing you too heavily against a matchup you may only see a fifth of your games. Multiple rapid-fire changes are best for early deckbuilding or for significant structural errors that you may have made. Remember, none of this is a substitute for good deckbuilding or good gameplay decisions. Even the most popular meta deck tends to make up a maximum of 20% of total decks played, and the total number of meta-competitve decks is easily close to the hundreds. If your deck isn’t equipped to handle something broad – like a specific faction or a common card – you need to weigh that weakness and decide whether it’s worth leaving in the deck. It’s OK to have inefficient answers sometimes – for example, when your Rakano deck has to throw a Torch on top of a card to get past Sandstorm Titan, but can usually win anyways. But if every time a Sandstorm Titan is played you don’t have any viable answer, then your deck has deeper systemic problems that will have to be fixed. One last piece of advice for the master grind: While Ranked is definitely there to test your skills, it is also a test of patience, temperament, and a willingness to learn from your opponents. Keep an even head on your shoulders. When something beats you, think about what you could have done differently – not what the game could do differently, or what a nut draw your opponent had. 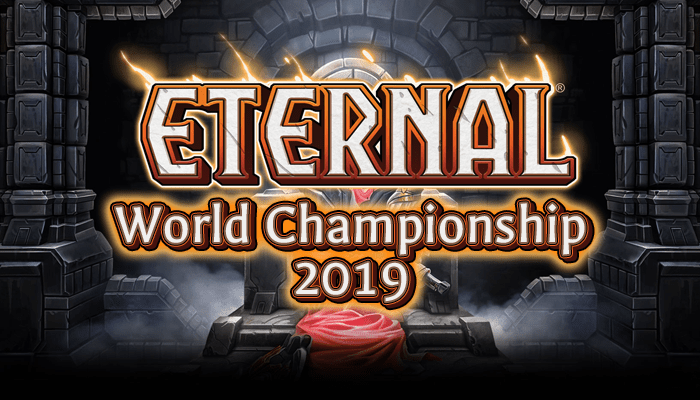 Eternal has a remarkable amount of complexity and flexibility – even at the highest levels, looking at your own play first before finding elsewhere to place the blame can reveal new lines of play that you never even anticipated. If you’re feeling truly tilted, take a short break, make sure you’re hydrated, then consider if you want to change decks or try something different. You don’t need to hit master right away, or even measure yourself by the yardstick of your league. Aim to improve your own game, and the rest of the pieces will fall in line. Once you’re up in the higher echelons, it can help to read up and study on the popular meta decks and how to counter them, and to expand your deck vocabulary a little beyond what you’ve personally brewed. RNGEternal is, of course, a great site to look! You can also check out the various Reddits and discords and wobsites for looks at what people are thinking about and playing. That’s it for today’s Getting Started. We have one last area to cover, perhaps the most exciting and rewarding of all: Draft! Tune in next time, and for now – go enjoy those new, fully-voiced cards in a rousing game of Ranked!